Jeff Miller, Mt. Vernon, S.D. Mershon and Lonnie Franssen, Amelia, Neb., bought Lot 17 at $11,500. Location: at the ranch south of Geddes, S.D. Varilek Angus held their 62nd annual Angus bull sale at the ranch near Geddes, S.D. This is a beautiful ranch located in the breaks around the Missouri River. That is the background for this breeding program that has never been more successful than right now! The Varileks offer their later born calves as two-year-olds, and their January and early February bulls as yearlings. This year there was tremendous demand on this big, stout set of two-year-old bulls, as well as a lot of breeder interest in the front end of the yearling bulls. A big crowd was on hand sale day. The temperature had come up, but so had the wind. A very fast-paced sale took place with many repeat buyers on hand. Top selling bull of the day was Lot 40, a yearling bull, selling for $22,000 to CRV-USA from Madison, Wisc. This bull was sired by Mogck Sure Shot and out of a daughter of Connealy Sullivan 83A. Born at 85 lb., he had a heavy weaning weight of 854 lb., before growing to a yearling weight of 1,539 lb. With a large 18 sq. in. rib eye, he had an IMF score of 5.57 percent. His EPDs were BW 1.5, WW 65, YW 111, and MM 34. 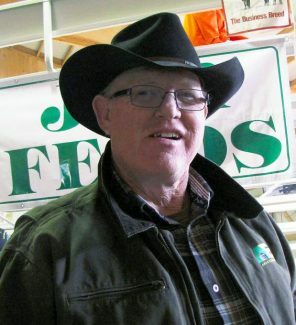 Fuoss Angus Ranch, Draper, S.D., chose Lot 3 at $20,000. He was a January yearling son of Connealy Confidence 0100 and out of a daughter of Connealy 044 062. He had EPDs of CED 14, BW -0.7 WW 60, YW 113, and MM32. With a 78 lb. birth weight, he had weaning and yearling weights of 817 lb. and 1,489 lb. He scanned a ribeye of 17.7 sq. in., had an IMF of 4.47 percent, and $Beef of 92.25. The Split Rock Cattle Co., Sioux Falls, S.D., bought the Lot 58 yearling bull at $16,000. Sired by Varilek Aberdeen 0036, he had an 89 lb. birth weight. He weaned at 827 lb. and grew to a yearling weight of 1,488 lb. He scanned a ribeye area of 16.40 sq. in. with an IMF of 5.52 percent. 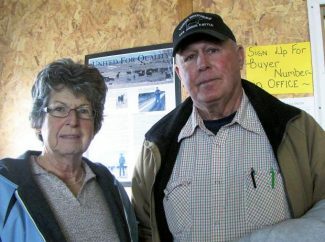 Mangen Angus Ranch, Broadus, Mont., purchased the Lot 6 yearling bull at $15,000. He was a son of Connealy Confidence 0100 and out of a daughter of Sitz Upward 307R. His grand dam was a Pathfinder. He had EPDs of CED 14, BW -0.8, WW 53, YW 96, and MM 29. He had entered the world at 68 lb., then weaned at 758 lb. before reaching a yearling weight of 1,344 lb. Lot 30, a January yearling bull by Flag Cross Country was out of a daughter of Final Answer. He brought $12,000 from Wright Bros., Corsica, S.D. This bull knew how to grow as he had a 911 lb. weaning weight and a yearling weight of 1,537 lb. His EPDs were CED 10, BW 0.7, WW 68, YW 108, and MM 23. Lonnie Franssen, Amelia Neb., topped his purchases with the Lot 17 yearling at $11,500. He was by Poss Total Impact 745 and out of a Pathfinder dam by Genetics by Design 049. Born at 90 lb., he weaned at 832 lb. and grew to a yearling weight of 1,418 lb. Lot 93 was a two-year-old that was bought by Split Rock Cattle, Sioux Falls, S.D., for $11,500. He was sired by TC Aberdeen 759 and out of a TC Freedom daughter. 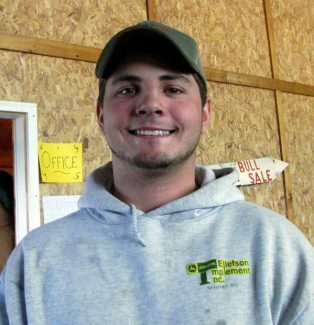 He had the heaviest yearling weight and third largest ribeye. His grand dam was a pathfinder. The high selling yearling heifer was Lot 141 selling for $2,400 to Brett Gumb, Burwell, Neb. She was sired by SydGen CC & 7 and out of a daughter of WAR Hall of Fame. Varilek's served a roast beef sandwich with cheese and onions that was as good as I've had!